This is just for starters, I just wanted to be able to see is on the Internet. I can get to the Internet on all devices in my network. But when I use port forwarding I cannot see my web server at all. 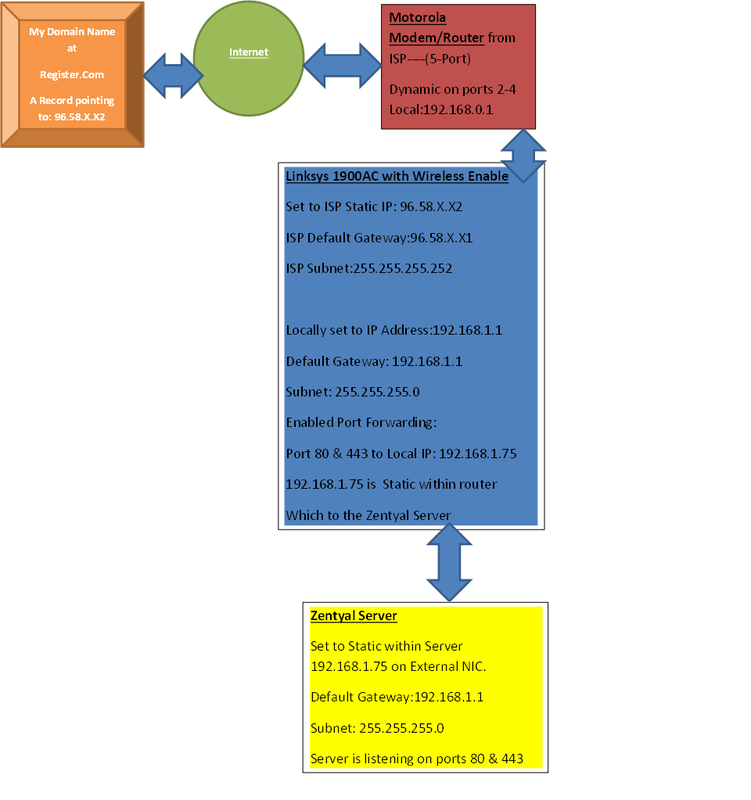 I did a test to make sure my web server was working properly, I removed my Linksys Router and placed my web server directly into Motorola ISP Modem/Router on WAN port 1 and it worked just fine after assigning it the static IP Address, default gateway, & subnet given by ISP to my Zentyal Webserver external NIC. I also have a noip.org account that I was using dynamic IP Address but I was having problems getting my email back to my server, I could send email to other places just fine but getting email back was the problem, this was before I got a Static IP from ISP. My Zentyal Server supports noip.org for use of dynamic IP Addresses so your web server never loses it's connection to your domain name or the Internet connection etc. My ISP is Bright House Networks and they state that they do not block inbound nor outbound ports. You can download Zentyal Server for 100% totally free at www.zentyal.com. Simply remove the Linksys router from the equation. If you remove the Linksys then the Zentyal box will grab your 96.58.x.x2 ip and be viewable to the web. Why do you need the Linksys router there? Zentyal will do everything the Linksys will do in terms of firewall and port forwarding plus more. There really isn't a point in have the linksys in front of the Zentyal. Not the answer you're looking for? Browse other questions tagged networking router webserver static-ip or ask your own question. Setup second static IP to server behind Netgear router?